Black & White Gallery / Project Space is pleased to present a selection of works by Henry Khudyakov. The exhibition will include paintings, assemblages, mixed media, literary works and poetry recitals, shedding light on Khudyakov’s artistic evolution. The exhibition inaugurates the gallery’s new location in Bushwick, Brooklyn and marks a new direction for Black & White Gallery / Project Space led by the belief that art is enhanced by exploration of diverse artistic forms of expression and connections between them. Henry Khudyakov: Final Brain Storm is the first comprehensive solo exhibition in 25 years of this radical, Russian-American artist who has enjoyed recognition for some time but until now has exhibited relatively rarely. 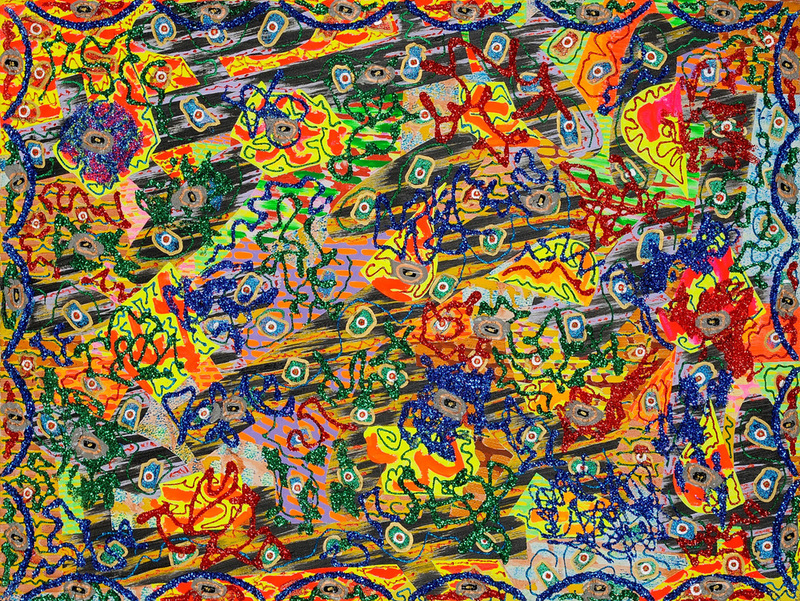 The exhibition title, Final Brain Storm, is drawn from the inscription on the back of one of Khudyakov’s paintings where he routinely documents his ongoing process. Presenting a selection of hypnotic paintings and assemblages he has created over the last 35 years, the exhibition highlights his use of recognizable materials - studs, hangers, chewing gum, Band-Aids, bows, glitter and more - all removed from their usual context and intertwined in a mysterious lingual and sensory network. Taking these familiar objects out of context leaves behind a sense of absence and creates a space for thought. To this very day Khudyakov continues to go back to earlier works, adding, expanding, and reinterpreting - further stretching the boundaries of what is commonly acknowledged as art. The roots of Khudyakov's art lie in literature. In the 1960s and 70s, a large part of the artist’s activity revolved around writing poetry. At that time, he began experimenting along the lines of the Concrete Poetry movement, as “It occurred to him that traditional forms – these orderly, blocky configurations – did not respond to the sharp, chaotic peaks of emotion that he was trying to convey in his poems,” as one literary historian wrote. In the late 1970s his growing interest in the forces that influence our lives led him to break away from writing poetry and crossover to visual arts. Methodically repeated shapes, varying within a controlled set of parameters, allowed the artist to focus on medium and form, rather than content, narrative and structure. 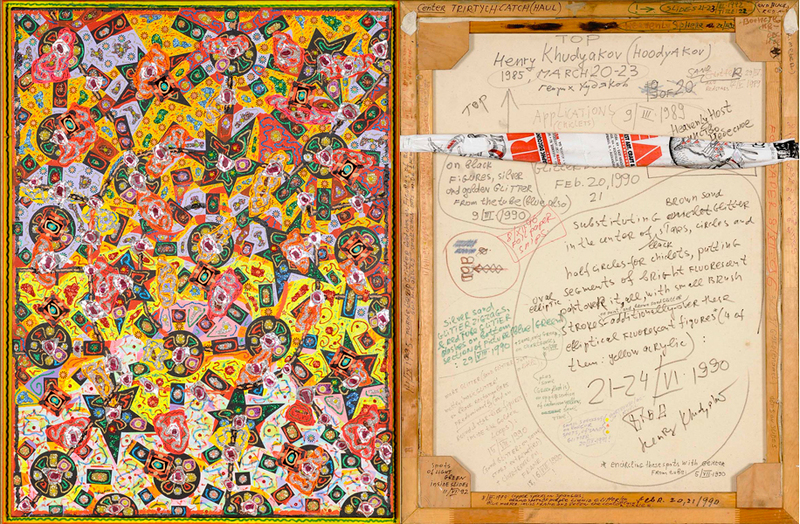 From the outset of his career as a visual artist, Khudyakov's manipulation of cheap collectibles, rejection of familiar artistic practices, integration of process-based technique, and most importantly, the interconnection between text and image, suggest strong affinities with Fluxus artists. He, like Fluxus organizer George Maciunas and his colleagues George Brecht, Yoko Ono, and Robert Filliou, took up the task of re-embedding art within everyday life, picking up where Dada and Russian Constructivist artists left off. Henry Khudyakov (b. 1930 in Chelyabinsk, Russia, lives and works in Jersey City, NJ) graduated from the Leningrad University in 1969. Until his immigration from the Soviet Union, he worked as an interpreter of technical texts from English and Czech languages into Russian. Upon his arrival to the USA in 1974, he translated Emily Dickinson and other English language poets into Russian and began working as a visual artist. His own poems have been published in different Russian language publications in the West and his innovative recitals, with their fractured, phonetic vernacular, have been well documented. Khudyakov’s work is in the collection of the Museum of Modern Art, NYC and has been included in several museum exhibitions, most notably in Nassau County Museum of Art, 1989. Black & White Gallery was founded in New York in 2002. From the start, the gallery has been committed to cultivating promising artists in the initial and more advanced phases of their careers exploring contemporary themes and concepts through multiple mediums.The Gallery's original location was a unique industrial indoor/outdoor ground floor space in Williamsburg, Brooklyn - the breeding ground of emerging talent at that time. From 2006 to 2010 Black & White Gallery operated from two locations - Williamsburg and Chelsea. In 2010 the Chelsea location was closed and not-for-profit Black & White Project Space was established. From 2010 to 2012 both the Gallery and Project Space operated side by side presenting simultaneous exhibition programs out of the Gallery's original indoor/outdoor location in Williamsburg. After a two-year hiatus, Black & White Gallery / Project Space is settling in Bushwick, Brooklyn - the current creative hub of New York City and will present an alternating exhibition module from one space - its new location at 56 Bogart Street, Brooklyn, NY. Sasha Okshteyn has recently joined Black & White Gallery / Project Space as a Co-Director, Curator and Manager for Black & White Project Space. Sasha brings first-hand experience in all fields of exhibition making. She was previously the Manager of Special Projects, Programming and Sponsorship at Ramsay Fairs, in charge of curating and producing site-specific installations for Pulse New York and Pulse Miami Art Fairs and responsible for sponsor relationships with Fortune 500 companies. Prior to joining Black & White Gallery / Project Space she worked as an Assistant Director at Slideluck, a not-for-profit art organization. Sasha holds a MA Degree in Visual Arts Administration from New York University (2011) and a BA Degree in Art History & Dance from George Washington University, Washington, DC.